The United Kingdom may soon become the first country to leave the European Union, pending the results of a June 23 referendum. As the vote nears, a new Pew Research Center survey highlights a key British complaint about the EU: Nearly two-thirds of Britons say they want the EU to return certain powers to national governments. Only 6% want to transfer more powers to the Brussels-based institution. The UK is not alone in its preference for a less centralized union. A median of 42% of Europeans across the 10 countries surveyed say they want to reclaim some powers from Brussels, while just 19% favor greater centralization (27% prefer the status quo). Only Greece, which spent much of last summer fighting the EU over a contentious debt crisis, rivals the UK in its desire for more autonomy (68% of Greeks voice this view). 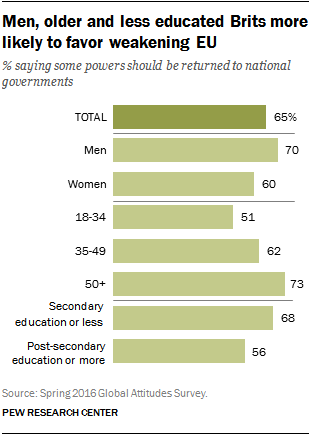 Older people in the UK are more likely to support reclaiming some powers from the EU. Almost three-quarters of British over the age of 50 take this position, compared with only 51% of those ages 18-35. Britons with less education are more likely than those with more education to favor Brussels returning some powers to national capitals (68% vs. 56%). And men are more likely than women to prefer this option. Disapproval of the EU’s handling of key issues could be driving British desire for increased autonomy. Fully 70% in the UK disapprove of Brussels’ handling of the refugee crisis and 55% feel the same way about the EU’s approach to European economic problems. Three-quarters of British who disapprove of the EU’s handling of economic problems and 71% of those who have an unfavorable view of the institution’s handling of the refugee crisis believe that Brussels should return powers to national governments. In contrast, just 49% of those who approve of the way in which the EU is dealing with these issues want powers returned. People in the UK are split on their overall opinion of Brussels, with 44% saying they have a favorable opinion of the EU and 48% reporting the opposite. The partisan divide on Brexit-related issues in the UK is stark. Supporters of the right-wing UK Independence Party (UKIP), known for its Euroskeptic views, overwhelmingly support weakening Brussels and are the most likely to hold negative opinions of the EU. There is a staggering 53-percentage-point gap on EU favorability between supporters of the center-left Labour Party (32% unfavorable) and UKIP sympathizers (85%). The center-right Conservatives fall in the middle, with 52% rating the institution unfavorably. Meanwhile, only about half of Labour sympathizers believe in a more decentralized EU, while the vast majority of Conservatives (77%) and UKIP supporters (93%) believe that Brussels should return certain powers to national governments. While Brits remain divided on whether leaving the EU is right for their country, key EU members outside of the UK are resolute: A majority in every member state surveyed says Brexit would be a bad thing.